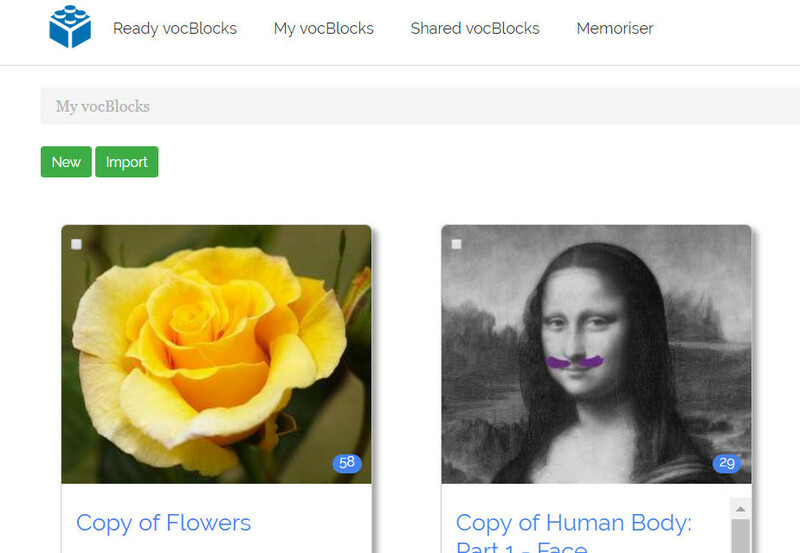 When it comes to creating your own vocBlocks you can drop in words and phrases as and when you pick them up or you can import whole lists of vocabulary to create your vocBlocks super fast and easy. It is a function that helps you create new vocBlocks by importing lists of words and phrases you have. Say, you are listening to a podcast ‘Are you big on small talk?’ from BBC Learning English website and would like to learn the new vocabulary listed for this podcast. All you need to do is copy and paste this vocabulary into a new vocBlock to start learning it straight away. Another example when the import fuction might come in handy is if you have been using some other spaced repetition software to grow your vocabulary, for example, Anki, and would like to have all the vocabulary you are learning in one place now. You can simply import your Anki decks to create new vocBlocks. You will need to go to My vocBlocks section on our website and hit Import button in the top left corner. You will be creating a new vocBlock so will need to name it, choose the languages used and make sure the format is the one you need. If you have a list of words to import, you need to choose one of the CSV formats depending on whether translation in your list comes before or after transcription. Further in this post I will explain in detail how to import short and long lists of vocabulary and explain what CSV format is. When importing Anki decks and Lingvo Tutor dictionaries, you will need to choose 'Anki Deck' for the former and 'Lingvo Tutor' for the latter from the drop down menue. 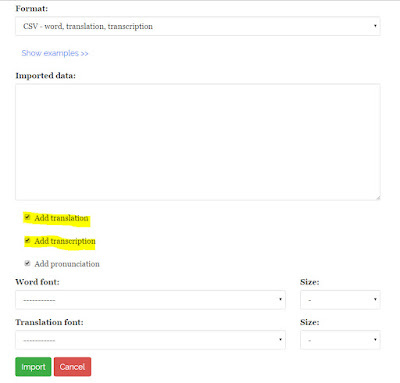 Once the format is chosen, copy and paste the imported data (see left screenshot below) or attach an Anki deck (see right screenshot below) and hit ‘Import’ button at the bottom of the page. Anki decks can also be dragged and dropped if you want it even quicker. To import short lists of vocabulary you need to put commas between words, their translation and transcription. This format, when data is separated by commas, is known as CSV format. CSV stands for comma separated value. so that 'slipped my mind' got into 'Word or phrase' field of your vocBlock entry and 'forgot' ended up in the 'Translation or explanation' field. The next important thing to keep in mind is that each line of your document will be converted into a separate vocBlock entry. So, you will need to make sure that the data that you want to be in the same vocBlock entry is not split across lines. Thus, in the example above I put the phrase and its explanation in one line though originally they were split across two. There are also a couple of minor tweaks which you might need to make to ensure the data you paste for importing converts properly. and the tool will know that the whole explanation is to be added to just one field and not to be split between ‘Translation or explanation’ and ‘Transcription’ fields. green card,n. a document that shows a person from a foreign country can live and work in the United States. It is not green, but once was, so it continues to be called a ““green card””. and the tool will leave the double quotes from the original text for you. green card, ”n. a document that shows a person from a foreign country can live and work in the United States. It is not green, but once was, so it continues to be called a ““green card”””. All I did in this example is split the explanation into two paragraphs and then added one more set of double quotes to enclose it so that the tool treats the explanation split across the lines as belonging to one vocBlock entry and doesn’t put the second paragraph into a new vocBlock entry. If you have long lists of vocabulary which need to be imported to a vocBlock, and these lists are not in CSV format, in order to speed up the process, you might want to use a spreadsheet application like MS Excel or a free one like Google Spreadsheets or OpenOffice Calc. Just copy and paste your lists of vocabulary into a spreadsheet and then export in CSV format before pasting the list into the 'Imported data' box. 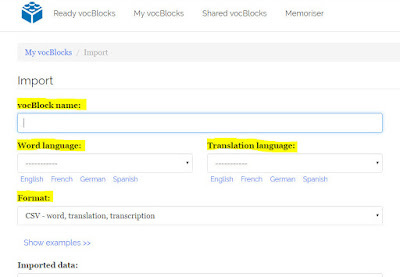 If you have a list of words without translation and/or transcription you can still import it to create a vocBlock and the missing transcription and translation will be added automatically from the built in dictionary. You can always untick the relevant boxes when importing data and the tool will not be adding the missing translation and/or transcription if you don’t need it for some reason. This will be automatically added to the vocBlock with the imported data so you will have a talking vocBlock without any extra effort from your side! And as with the transcription and translation you can always untick the box to have no audio added to your vocBlock. We hope that you find this short guide on creating vocBlocks with Import useful. But if we have missed anything or you have a question please do not hesitate to drop us a line.